Pili Lugadi song is a famous traditional song of Rajasthan. 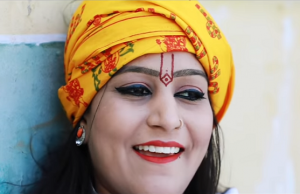 This Peeli Lugdi video song is one of the great hit number of Rekha Rao Rajasthani Folk singer. Her folk tone of voice makes this song more beautiful. The energetic number leaves its footsteps of folk touch. You cannot stop yourself from dancing with the song with Rajasthani folk dance steps. This soundtrack was an instant hit when it was released. This is an all time Rajasthani hit song for the wedding seasons. This song was most appreciated from the Rajasthani music lovers. Especially, Rajasthani girls are more interested to dance on the song Pili Lugadi. It was also the best Rajasthani DJ song of the time. The plus point for Pili Lugdi song is that the song has a touch of folk music with a strong lead voice of Rekha Rao. Let’s have fun with the song Pili Lugdi song here. Share this post with your friends on your social profiles, like Facebook and Gplus.